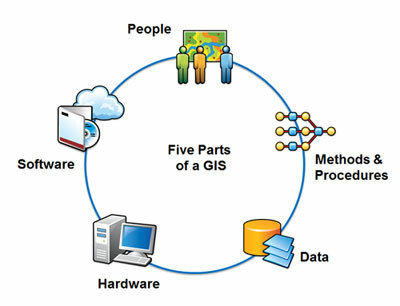 Years ago when introducing GIS, we often talked about the five essential parts that make for a successful implementation–hardware, software, data, methods (or procedures), and people. These same five parts are still valid today, though their context has evolved considerably over time. Hardware, software, data, and methods are challenges that we can manage in straightforward ways. We can understand what needs to be done, and we can identify the solution. The latter ingredient–people–is the most complex factor. It’s the wildcard of GIS, and is also the primary key to successfully lifting a GIS off the ground, nurturing its growth, and (perhaps more importantly) keeping it relevant over time. Every successful GIS has champions that helped lift it. The enduring and relevant ones have more than a champion or two, they have a community of “investors,” consumers, and collaborators that add the vibrancy, relevancy, and currency that keeps a GIS going. But these people factors have needed to evolve on their own, often in complex and politically influenced ways. The GIS software that supports more concrete technical needs, like building and maintaining geodatabases, making maps, modeling processes, and performing analysis doesn’t offer a solution to these complex human factors. Or does it? With the recent roll-out of ArcGIS Online subscriptions for organizations, the cloud-based capabilities that it provides offer a compelling platform for GIS users. I’m often focused on the technical aspects of what ArcGIS Online delivers, and so when asked about its value I’m focused on the technical tangibles. Features like the ability to publish hosted services in Esri’s cloud, define user roles/access/security, the ability to manage geospatial assets, add mapping to Microsoft Office, tools to support collaboration, and other technical capabilities are often things that come to mind first. At the recent Esri International User Conference I had the privilege of getting to know John Thomas, Director of Planning for the Utah Department of Transportation (UDOT), and Frank Pisani, UDOT’s GIS manager. 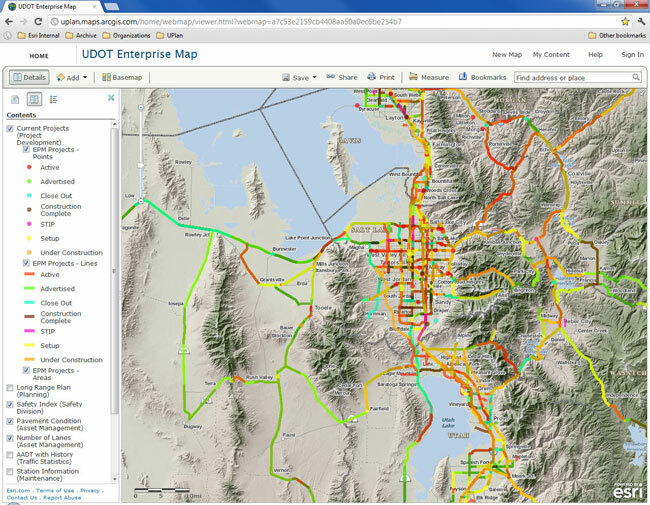 UDOT was an early adopter of ArcGIS Online, participating in our beta program, and integrating ArcGIS Online into UDOT’s daily activities and missions via their UPlan site. 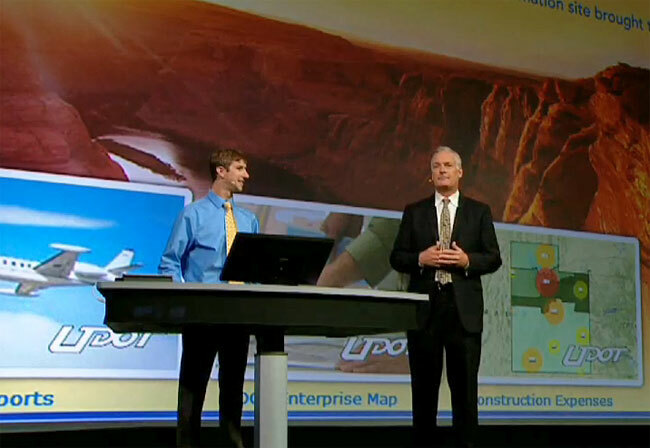 (From left to right) Frank Pisani and John Thomas talk about the success of UPlan at the 2012 Esri User Conference. I learned a lot from John and Frank, and from UPlan. I learned that the real value of ArcGIS Online is not so much the features and functions that it provides; it’s the transformation it can create in the way organizations think about, and use, GIS. One of the maps featured during the User Conference presentation was the UPlan enterprise map, comprised of many different layers coming from many different departments, now brought together in a single, dynamic application with information that is continuously updated. The UPlan Enterprise Map - built from information contributed by different departments, bringing people (and the conversation) together over a map. Data previously locked in disparate files or proprietary applications could now be easily accessed by anyone. Hard copy documents that were expensive to produce and were soon out of date had been replaced by live maps that can be updated frequentely, and used by a much broader audience. Once the first few successes were achieved, John told me that others throughout the organization began to realize the benefits and began to participate as well. This growing momentum quickly transformed information access across UDOT. “I would walk over the traffic group and ask, actually beg, for their information, to download onto a flash drive I’d carry,” said John. “Then I would walk that flash drive over to our GIS analyst, who would then download the data off of the flashdrive, and then finally load that data into a map.” How things have changed! Frank Pisani, UDOT’s GIS manager, described his role as a “service provider” for his organization. “It is my job to make sure our spatial data is available, and authoritative. ArcGIS Online is changing the way I am able to support my department, and changing the way people are thinking about maps.” No longer are map requests being satisfied with static PDF files; instead, the expectations are for live, dynamic maps shared via a link that users find in their inbox. Frank also talked about how the ArcGIS Online-based UPlan site, custom configured to display a unique UPlan look and feel, along with a gallery ribbon of specially chosen content, provides a meeting place for all members of the organization. It’s also a place where even casual users can find needed information easily. A gathering place for all - the UPlan home page where anyone can find and use needed geographic information. I was permitted administrative access for a time, and was able to look behind the scenes and see how ArcGIS Online was being implemented. 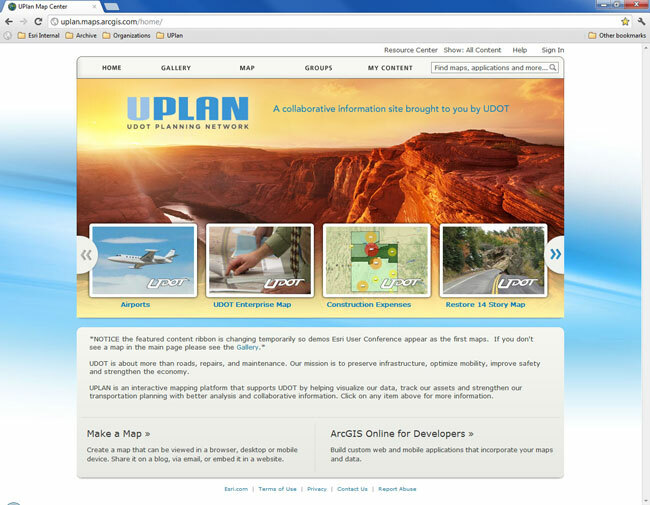 ArcGIS Online groups at UPlan reflected how UDOT organizes itself. “Our groups mirror the way we operate at UDOT,” Frank told me. I discovered that some of the groups are focused around collaboration on specific projects, while others are focused on different regional management units and their activities, yet others represent different departments within UDOT. These things all address that key aspect of a successful GIS implementation–the people. What I learned from my time spent with UDOT, and with John and Frank, is that the real value of ArcGIS Online lies not just in the details of the technical capabilities that it delivers, but in how these reflect themselves within an organization to facilitate participation, collaboration, empowerment, and communication. Perhaps we’ve finally built software to support not just essential GIS functions, but also software that supports that elusive and all important aspect of a successful GIS–the people.